We have often been asked about the titles that John Wesley included in his Christian Library, a collection of books he considered highly advisable for his Methodists. However, recognizing the value in the work of some authors did nothing to alleviate his concern for their positions on certain theological points, he freely wielded the editor’s privilege to remove objectionable passages. 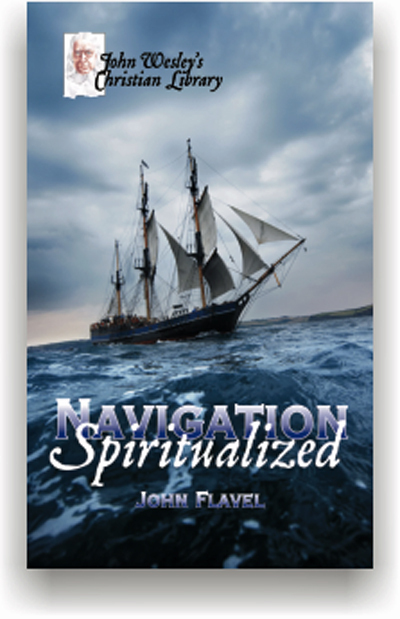 Navigation Spiritualized is a great example. In the seventeenth century, Presbyterian John Flavel ministered in the important seaport of Dartmouth, England. With such a rich seafaring culture among his parishioners, Flavel sought to present the Gospel in terms familiar to them. The result of his labor was this analogy of the Christian’s adventures on the seas of life amidst storms, leaky vessels and rocks on the shore. In the spirit of Wesley’s editorial work, this edition has been adjusted in some very minor ways. While the extract consists of his text, punctuation and capitalization have been brought closer to modern usage. The result is an easier volume for the modern reader.